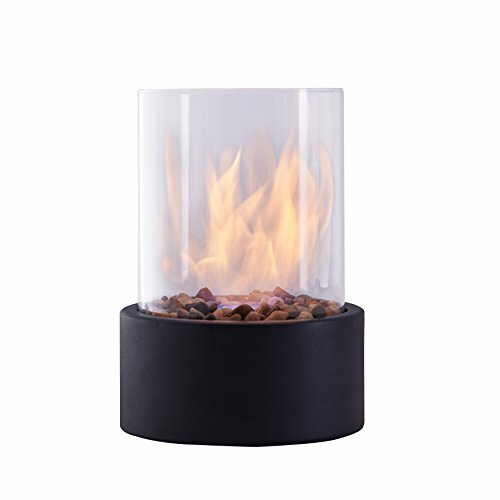 Easy and economical, the Small Danya B. Indoor / Outdoor Portable Tabletop Fire Pit is a great way to generate warmth in your living space while also adding a touch of sophistication to your ambiance. Modern in every sense of the word, this elegant tabletop fireplace sports a sleek black metal base, a removable cylindrical glass body, and reusable fiberglass for use with ethanol fuel, decorative rocks and a sniffer. Enjoy the ambiance of real fire without the inconvenience of melting wax, smoke, soot, and ash. Prop it indoor or outdoor, on your dinner table, party table or your coffee table-the possibilities are endless!